While job growth is the traditional driver of new home demand, the San Diego market recovery has been spurred on by primarily a dwindling of inventory, coupled with a continuation of government sponsored low interest rates. Analysts believe unsold inventory levels will remain relatively low for at least the next 12 to 18 months giving job growth in San Diego County an opportunity to rebound completely over the next few years. The increase in jobs is expected to give “new legs” to the current inventory depleted market rebound – giving us at least a three to five year upcycle. Like many of the past housing market upcycles, overheated demand for subdivision land in the traditional location hotbeds, such as North Coastal San Diego County, have begun to spill over into communities located further east and inland – where there is a slightly greater number of available properties for sale. Available subdivision land in North San Diego County communities, especially San Marcos, is experiencing a significant increase in demand from builders. While we saw residential subdivision land typically trading for around $200,000 a finished lot in early 2012, we are now seeing in the first quarter of 2013 lots going as high as $285,000 a finished lot. The finished lot value for residential subdivision land in San Marcos has increased in excess of 40% over the last year! The City of San Marcos is undergoing significant upgrades with an expanding university town with over 14,000 full time students now at California State University at San Marcos (compared to just 9,722 students in 2011), the recent opening of the new “high technology” public high scool, and the remodel of San Marcos High School. The $180 million remodel project was one of the largest high school construction projects in the State of California and now boasts higher test scores than some of the public high schools located within the prestigious school districts situated along North Coastal San Diego County (south of Oceanside). Planned development of the approximately 1,000-unit University District mixed-use master plan beginning in 2014 (to be located near the CSU Campus and 78 Freeway) and the new linear mixed-use development plans running several blocks east and west (parallel to San Marcos Boulevard and the upscale Discovery Hills single family neighborhoods), will transform much of San Marcos beyond its “poor man’s Carlsbad” traditional reputation. With the present market momentum continuing its course in the near term and moving towards complete restoration of the residential real estate values lost in San Diego County during the recession, Team San Diego sees the next generation of residential subdivision land opportunities in North San Diego County also migrating up the 15 Freeway (north of Escondido) to communities such as Bonsall (with outstanding schools) and the unincorporated Pala Mesa area (with the widening of Highway 76 / Mission Road – serving as a four lane expressway connecting Interstate 5 with Interstate 15). It is also important to note that approximately one third of the actively selling new home developments in 2012 consisted of condominiums or townhomes. We expect that percentage to dramatically rise in the near term as monthly rental rates in many parts of the county now exceed monthly mortgage payments (i.e., P.I.T.I. and association dues), available at new construction condominium and townhouse communities. Evidence that this market momentum is growing can be seen in the sales volume reported for the traditionally slow 4th Quarter holiday season where sales exceeded the previous quarter and there was approximately a 30% increase in comparison to the 4th Quarter of 2011 (i.e., 494 sales reported in the 4th Quarter of 2011 versus 642 sales accounted for in the 4th Quarter of 2012). Although the average rate of absorptions of actively selling developments is still in the 2.0 sales a month range, a rapid decline in available new home supply is expected to boost absorption rates on remaining projects in the near term. For example, there were 113 actively selling new home developments in San Diego County during the 4th Quarter of 2011. 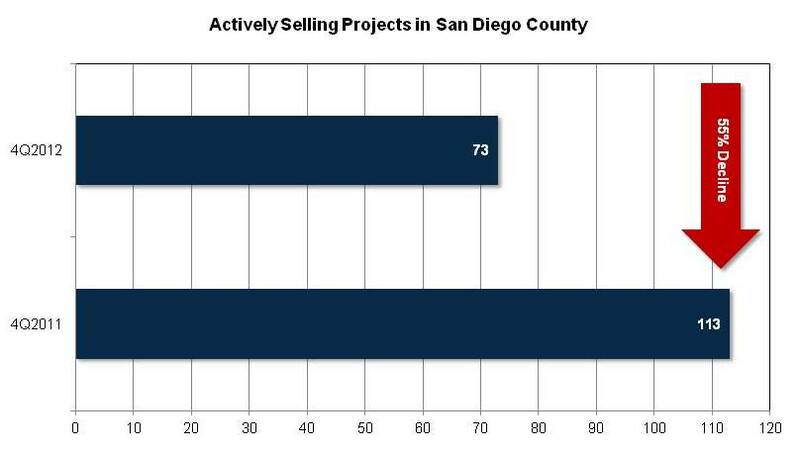 At the end of 2012, there were only 73 actively selling projects – that’s a 55% decline. Approximately 60 projects sold out over the course of 2012, while only approximately 20 new projects entered the market during the same period of time. Among the remaining new home developments in the County, approximately 2,233 units are left to either enter the market or currently remain unsold. This equates to approximately an 11 month supply based upon a continuation of new home sales at a minimum of last year’s rate (i.e., approximately 2,428 annual sales reflecting a recovery beginning in the 2nd Quarter of 2012). This bodes well for the health of the market going forward given 2012 sales did not pick up steam until the 2nd Quarter. Thus 2013 sales are expected to exceed last year’s total. Historically, approximately a 12 month supply of unsold inventory (units offered for sale and remaining unsold), is considered approaching a supply/demand balance. Many housing analysts refer to the housing market rebound in San DiegoCounty and the nation as a “jobless recovery.” While there is no question that the combination of a dwindling inventory and historically low interest rates have jump started the market, job creation in San Diego County over the last year has increased notably (approximately 29,000 annual net new jobs by year’s end in 2012 as estimated by Point Loma University Economist Lynn Reaser). This is a major factor which has largely flown under the radar due to the publicity related to a declining but relatively high unemployment rate (8.4%). The Land Advisors Organization Team in San Diego is actively sourcing new land development and home building opportunities. Call us today before this train is out of sight!